Leeds United have sold defender Jason Pearce to relegation rivals Wigan Athletic for an undisclosed fee. Head coach Neil Redfearn had indicated he wanted to keep the former United skipper at Elland Road, but before his disqualification as owner Massimo Cellino is believed to have told Pearce the club would listen to offers for him in the January window. 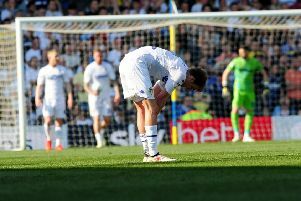 Pearce lost his regular starting place in the Leeds line-up since Redfearn took over as permanent head coach and was replaced as skipper initially by the also departed Stephen Warnock then by Liam Cooper. Leeds initially rejected an approach for Pearce from Wigan, but following the loan signing of Sol Bamba have changed their mind, deciding to cash in despite being without Italian centre-back Giuseppe Bellusci for the next two games as he serves a ban for his sending off against Bournemouth. Pearce made 112 appearances for Leeds after joining from Portsmouth for £500,000 in 2012. He could be joined at Wigan by another ex-Leeds captain with the Latics also weighing up a move for midfielder Rodolph Austin, who is out of contract this summer. Leeds, meanwhile, are looking to bring in further reinforcements before the transfer window shuts with Millwall’s Pontefract-born winger Martyn Woolford believed to be a target along with Catania striker Edgar Cani and Sassuolo forward Leonardo Pavoletti. United have made a new appointment to their board following Cellino’s resignation as club president last Friday. Giampaolo Caboni, a 61-year-old who worked with Cellino at Serie A side Cagliari, was confirmed as a director by Companies House yesterday. Caboni is also a director of Eleonora Immobiliare, an Italian firm which acts as parent company for Eleonora Sport Ltd. Eleonora Sport Ltd was used by Cellino to buy a 75 per cent stake in Leeds last April.